Thank you for your interest in Extracellular Differential Amplifiers. Please complete and submit the form below and an ADInstruments representative will aim to get in touch within one working day. If you’d like to speak to someone immediately, office contact information is available from the contact page. 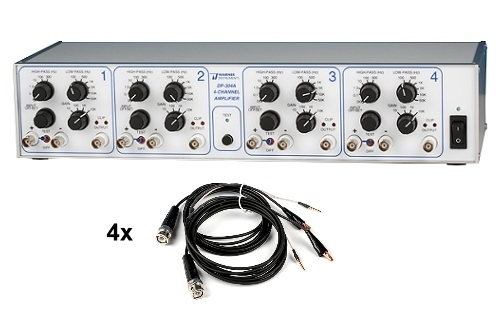 A low noise, high input impedance, four channel AC/DC differential pre-amplifier ideally suited for extracellular recordings. It has a voltage gain of x10, x100, x1000 and x10,000 and a CMR of 120 dB min at 60 Hz​. Four IC-4M Input Cable Set for DP-301/304 (2mm Pin/Alligator Clip, 2pk) are supplied. A low noise, high input impedance, four channel AC/DC differential pre-amplifier ideally suited for extracellular recordings. It has a voltage gain of x10, x100, x1000 and x10,000 and a CMR of 120 dB min at 60 Hz. Four standard IC-2S Input Cable Set for DP-301/304A (Unterminated, 2 pk) are supplied. A low noise, high input impedance, one channel AC/DC differential pre-amplifier ideally suited for extracellular recordings. 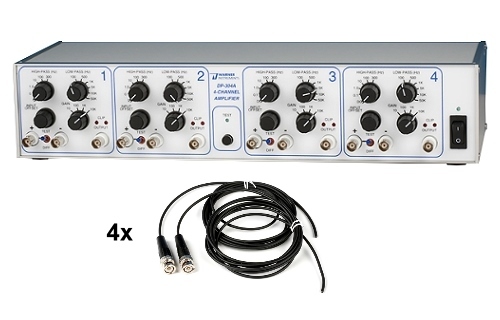 It has a voltage gain of x100, x1000 and x10,000 and a CMR of 100 dB min at 60 Hz. An IC-4M Input Cable Set for DP-301/304 (2mm Pin/Alligator Clip, 2pk) is supplied. A low noise, high input impedance, one channel AC/DC differential pre-amplifier ideally suited for extracellular recordings. 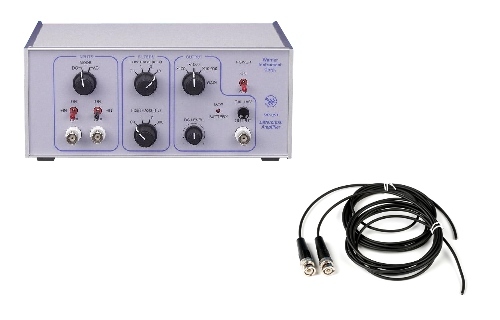 It has a voltage gain of x100, x1000 and x10,000 and a CMR of 100 dB min at 60 Hz. A standard IC-2S Input Cable Set for DP-301/304A (Unterminated, 2 pk) is supplied. 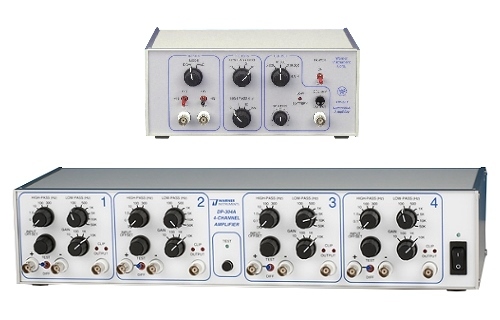 Low noise, high input impedance, AC/DC differential pre-amplifiers, which ideally suited for extracellular recordings and available in one or four channels. Amplified signals can be recorded and analysed using a PowerLab and LabChart data acquisition system. 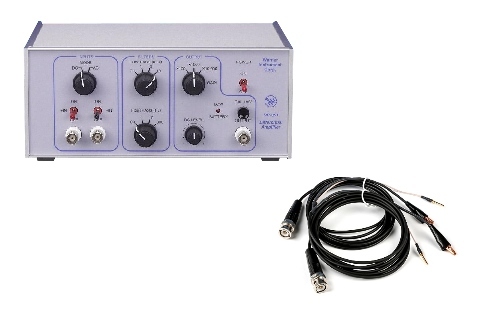 Additionally, the single channel pre-amplifier is battery powered (4 standard 9 V transistor batteries, ~500 hours of normal operation) and its small size provides portability and easy placement at measurement site or inside a Faraday cage. Input Cables: For each channel, the differential pre-amplifiers can be ordered with either the standard IC-2S Input Cable Set (Unterminated, 2 pack) or IC-4M Input Cable Set (2 mm Pin/Alligator Clip, 2 pack), at no additional cost if specified at time of order. If unspecified, the pre-amplifiers will ship with IC-2S Input Cable Set (Unterminated, 2 pack), which are not terminated at the outboard end.